Photo: Demarest House, ca. 1794, Main Street, River Edge, NJ. The house was moved to River Edge from original site beside French Burial Ground in New Milford about 1955. Listed on the National Register of Historic Places in 1983. Photographed by User:Bill Coughlin (own work), 2008, [cc-by-3.0 (creativecommons.org/licenses/by/3.0)], via Wikimedia Commons, accessed September, 2013. In 1609, when Henry Hudson sailed the Half Moon up the Hudson River, what was later to become Bergen County was occupied by the Minsi (Munsee), a sub-tribe of the Lenni Lenape, or Delaware, Indians. They had established several large villages and numerous small settlements throughout the region and threaded the country from the northern mountains to the sea coast with well-defined trails leading to their favorite fishing and hunting grounds. They also did a little farming. It is estimated that the Lenape numbered about 10,000 in the State when in 1618 the Dutch East India Company established a trading post called Bergen in what is now Hudson County, New Jersey. The conjecture that Norwegians among the first settlers named the post after Bergen in Norway is accepted by some historians; others hold that the settlement was named after the Dutch village of Bergen-op-Zoom, or that the name was derived from the features of the countryside, "Bergen" denoting a ridge between two marshlands. Title to the region, named New Netherland, was claimed by the East India Company a private enterprise chartered by the Dutch government by virtue of the discoveries of Henry Hudson. In 1621 the territory, including what are now New Jersey, New York and part of Connecticut, was taken over by the Dutch West India Company, which like its predecessor displayed little interest in its American holdings. As interest in settlement gradually increased the company in 1629 offered the feudal title of patroon and an extensive grant of land to any member who would establish 50 settlers. The patroon system was unsuccessful. Grants were made to Michael Pauw in 1630 and to Myndert Myndertsen Van der Horst in 1641, but it was apparent that Dutch colonization would not be encouraged by the absolute power of the patroons. 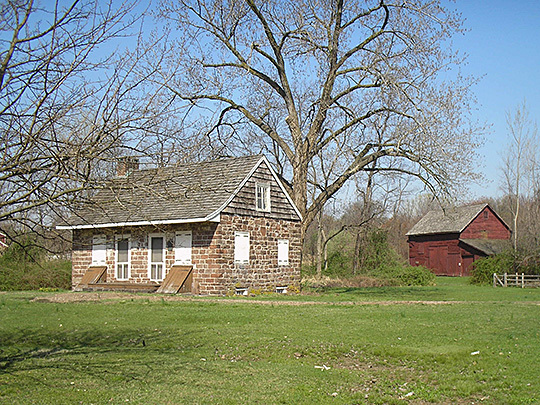 Opposite the mouth of Overpeck Creek, on the Indian trail leading to Pavonia (Michael Pauw's colony), some of Van der Horst's settlers built a fort and trading depot. And in 1640 Capt. David Pietersen De Vries established Vriesendael near what is now New Bridge. Two years earlier Oratam, sachem of the Achensachys, had granted to Sarah Kierstede 2,120 acres along Overpeck Creek for her services as interpreter in his treaty negotiations with the Dutch. To stimulate colonization the company in 1640 offered 200 acres to anyone who would bring with him five men to till the ground. In 1650 the company placed on the land stock and implements for which settlers were permitted to pay rent. At the end of six years the settler was obliged to pay for the stock. But this effort was interrupted by an Indian uprising in 1643 which drove out all settlers but a few in Pavonia. In Bergen a speedy peace was negotiated with Oratam, but uprisings continued intermittently until 1658, when Gov. Peter Stuyvesant repurchased an area "on the west side of the North River from the great Clip ... above Weehacken (Bergen)." This is the first Indian deed to mention Bergen by name. Bergen was granted a charter by the New Netherland Council, and settlers were induced to return by relief from "tithes and other similar burdens" for six years, provided that they settled together for defense. On September 15, 1661, a schout (sheriff) was appointed to administer justice with the aid of the schepens (judges). Two years later the schout and three schepens were made an inferior Court of Justice, empowered to settle "all matters touching civil affairs, security and peace of the inhabitants of Bergen." Negotiations with the Indians were still necessary; in 1662 Oratam and another chief were authorized to arrest anyone selling "brandy" in the lands still under their jurisdiction. Indeed, Oratam had once refused to ratify the sale of land on which Garfield now stands because rum and beer were part of the price. Even though European settlement was slow during the seventeenth century the Indians disappeared rapidly from the county. They can be recalled today only through their numerous artifacts and a number of place names. Oratam, who several times acted as intermediary between warring tribes and the New Netherland Council, is commemorated on the official seal of Hackensack. In 1664 Fort Amsterdam on Manhattan surrendered to a British fleet commanded by Col. Richard Nicolls, and New Netherland became a proprietary colony of James, Duke of York. He handed New Jersey over to John, Lord Berkeley and Sir George Carteret, who drew up a constitution in England, February 10, 1665, called "The Concession and Agreement of the Lords Proprietors of the Province of New Caesarea, or New Jersey," which established civil government for "all such as shall settle or plant there." The document appointed Philip Carteret, a relative of Sir George, governor and bound the proprietors to levy taxes only with "the consent of the legislature and not otherwise." Despite this and other concessions, proprietary rule, as in other colonies, threatened to revive in New Jersey the worst features of the patroon system. Settlers who held land under Indian deeds confirmed by Nicolls objected to the proprietors' demands for annual rents. Barred from the legislative assembly, a number of delegates in 1670 formed the basis of an anti proprietary party which refused payment of quitrents. The same year Carteret and the Council issued a charter to the freeholders of Bergen Township which confirmed the land rights of the Dutch charter of 1658. The document provided for the establishment of a court, support of the church and a free school.